Storage replication - Data replication is achieved by means of storage mirroring independent from the database software. Disks are mirrored without a control process from the SAP HANA system. This is typically offered by the hardware manufacturer. Host auto-failure - using a hot standby system, where in case of a failure, data and log volumes of a failed worker node are taken over by a standby node. SAP HANA System Replication - SAP HANA constantly replicates all data to a secondary SAP HANA system. In case of a primary failure, where the secondary needs to take over it will use the last data snapshot and will replay the log since the snapshot timestamp. With the data snapshot, the primary system also sends information about the tables loaded in memory if the parameter 'preload_column_tables' is set to 'true'. If this parameter is also set to 'true' on the secondary system, these tables are preloaded in the memory of the secondary database. This reduces the recovery time, making HANA system replication a faster high availability solution in terms of recovery. There are various synchronization modes (including Synchronous on disk, Synchronous in memory, Asynchronous and Full Sync). You can read more about it in SAP technical documentation. 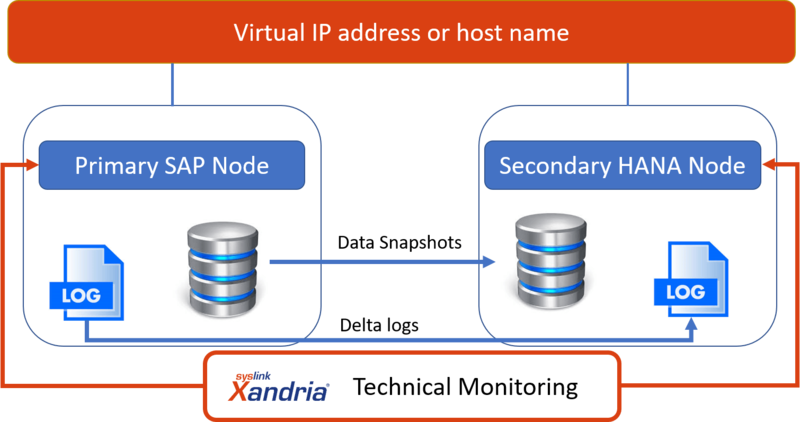 Using Xandria they get a complete visibility, via a single pane of glass, that their replication process is working and will work successfully. DR scenarios, tests or real, are stressful enough for the support teams. Xandria gives the SAP support teams confidence going into a DR scenario that all necessary technical components will be operational and ready for secondary system use.